Living in my garage. 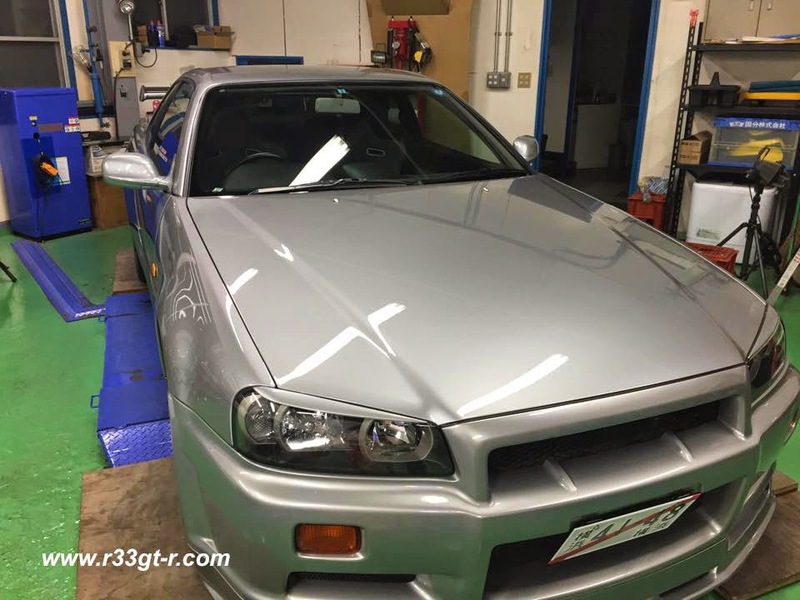 No, I haven't decided I have a sudden need for an R34 GT-R; my friend Ross in Canada happened to buy a near pristine KR4 (same color as mine!) 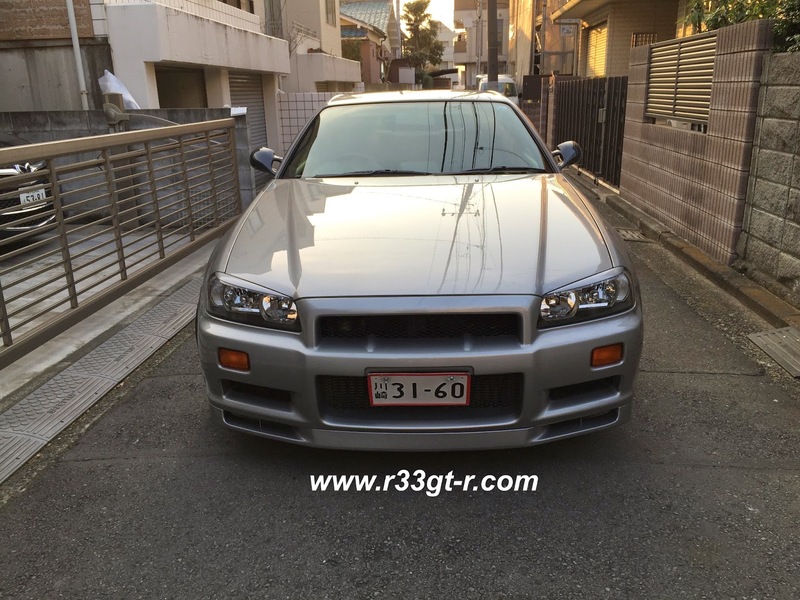 zenki (1999) BNR34 at auction (with only 20,000 kms!) and needed a place to store it during the snowy season in Canada. He would then have the car shipped to him in March, to arrive just about now. Naturally, as a GT-R fan I couldn't say no, plus I had that extra space doing nothing. Here's a video shot by Derek Wheldon of Pacific Coast Imports, who did the actual buying of the car at auction for Arneja Trading, the agent who imported it into Canada for Ross. First order of business once the car was in my hands was to take the car to RAPT to get it properly detailed, and those ugly foglights removed. Kabe-san, giving the car a once over, believed the car's mileage to be genuine. However, he postulated that the car must have been left outside for much of its life. 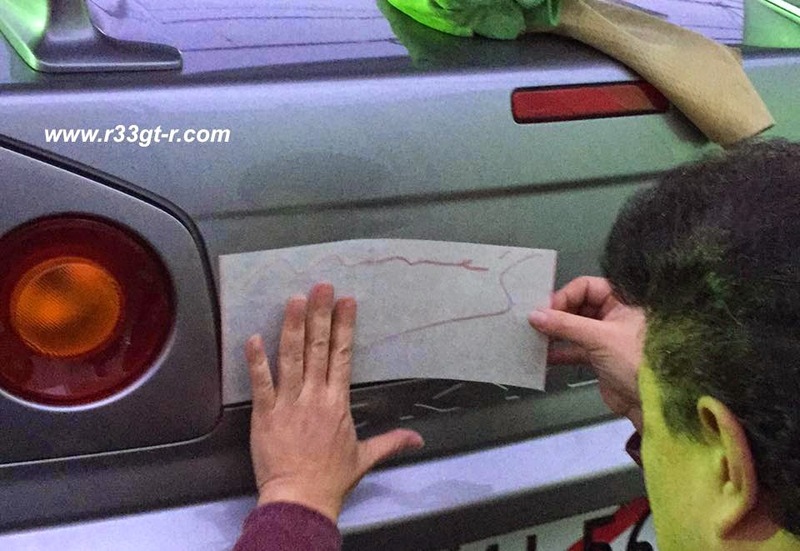 Clues to this included some hairline cracks in the paint, some discoloration spots UNDER the clear coat, etched in rain spots on the glass and flat surfaces, and a badly cracked old style Nismo sticker on the trunk (as seen in the video). Amazing what a professional detail can do! Note yes that there are still a few places where a respray will be needed, but to me a respray is cosmetic and takes nothing away from the mechanical condition of the car, which is what is most important. 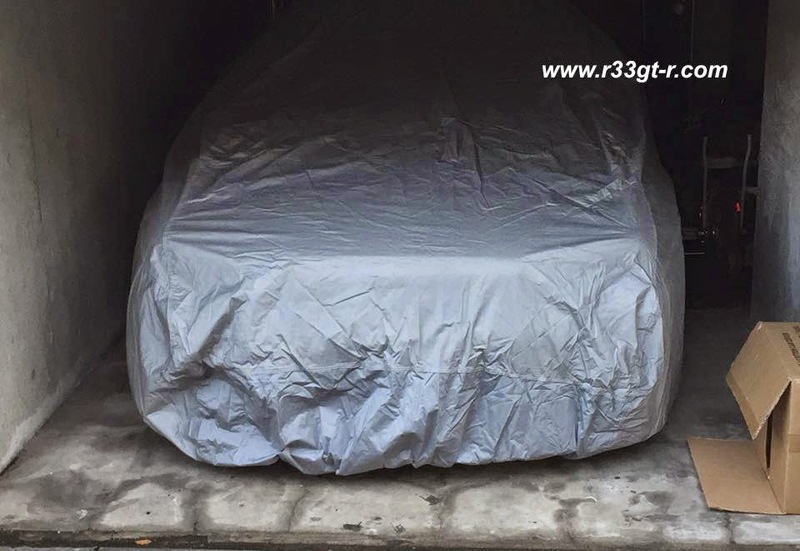 Anyway, once I got the car back from RAPT, I ordered a car cover, and put the car away for a few months. Meanwhile, Ross had found out that my friend Dino Dalle Carbonare was looking to sell his Mine's BNR34 titanium muffler and Mine's BNR34 carbon wing mirrors. A negotiation ensued, a price was decided - and then someone (me) had the brilliant idea that, since I have a long running relationship with Mine's - why not get Mine's to install those Mine's parts? 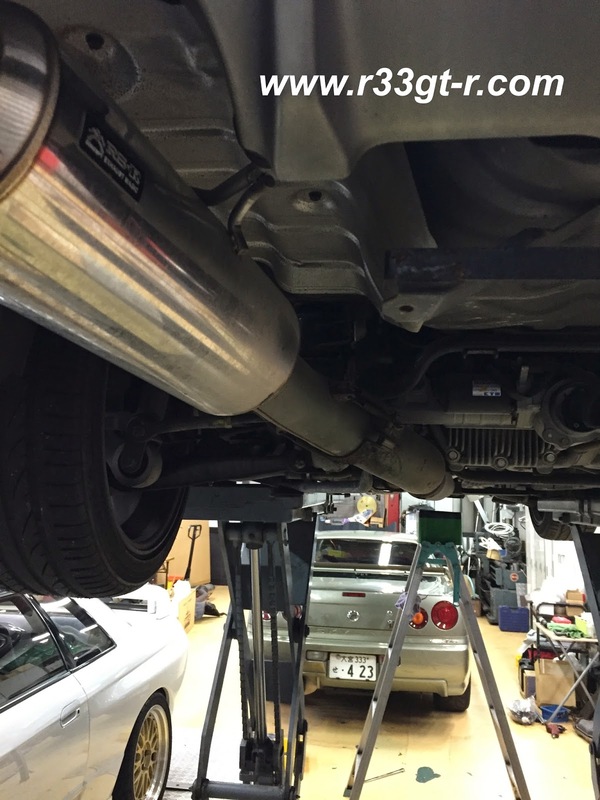 Plus, do a once over mechanical inspection to ensure the car was in good shape. So I called Mine's and arranged for a little visit to do all this in early March. Some good company... that NSX-R was awesome! 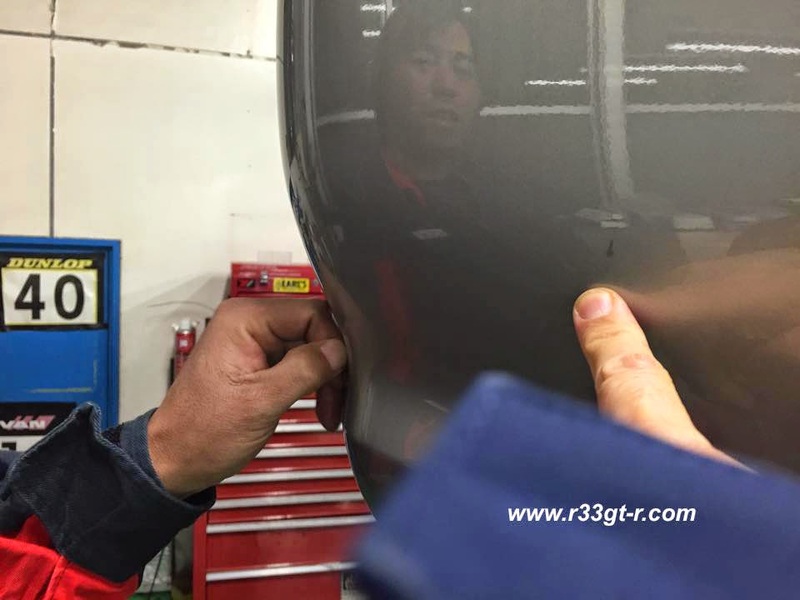 found only on certain cars like their demo cars and a few select customer cars! yay! OK - now for what people really want to know - my driving impressions. First, it wasn't my car, so I wasn't going to go crazy with it (and, as Nakayama-san at Mine's pointed out later, the tires were hard and cracked... could they be the original OEM tires?!! I knew they felt funny). Second, I only drove in the city and the expressway. Third, it's hard to compare this 34 with my car because my car is tuned up both in power and handling - however I have tried to compare to what I remember when I got my 33 back in 2005 when it was near stock. Also, this 34 had an aftermarket exhaust and suspension, so that may also have affected my perceptions. First, the good. The engine, given how little it's been used, absolutely purrs. But, I also believe that build quality must have been better, as my car's OEM engine, with only 50,000kms on it, was not as smooth. Clearly, there is also more boost off the line, which makes the car feel more peppy? In any case the engine felt "just right" -not weak, not overly powerful - for the job. And this could have been the gearing as well - in any case, the car felt very easy to drive. Also, the body rigidity was clearly better (I think mostly from the extra rigidity in the C pillars/roof area), and yes the car does feel a bit smaller than the 33. At expressway speeds, however, the 33 is a better drive - a bit more stable, although I think the 34's underbody aero does a lot to minimize the differences. However, the 6 speed Getrag on the 34 sure is nice to have, as 6th acts as an overdrive to lower the RPMs at speed (and thus makes the engine and thus car a bit quieter). Next, stuff that is not necessarily good and not necessarily bad. I am not sure to what extent this is due to the narrow OEM tires, but the steering was extremely light, and also somewhat numb. The car felt like a luxury sedan in that respect. I definitely wanted more feedback, and would have preferred less power assist. But, it did make for extremely easy driving in the city. So together with the gearing and the extra boost, Nissan DID manage to accomplish one of its goals, which was to make the car easier to drive than the 33, which was deemed fast enough. Also, I liked the Multi Function Display - it was fun to fiddle with, but I am used to 3 gauges and so having only 2 there... but the ability to change the display is cool. The MFD would probably be useful on the track, if it was preset to show the important stuff like oil temperature and boost. yes, fun in the beginning but do I really need all that info? Meh... just doesn't look as good, sorry. And does a stock 34 really rev up to 9000? So there you have it - my impressions of the 34 vs the 33. Clearly, these cars are very similar - and it makes sense as the engine and chassis are fundamentally the same. The differences, both good and bad, are minor, and nothing that money can't fix or improve. Again it would have been nice to see the differences on the track but that wasn't going to happen, hence my picking on relatively superficial aspects of each car. Hopefully sometime in the future I will be able to drive a 34 similarly tuned to the specifications of my car, so I can do a direct comparison! In any case - a week after the Mine's visit the car was picked up to be put onto the ship. Thanks Ross for trusting me with your car - I certainly hope you enjoy it! Still looking good for the trip overseas! The Mine's Titanium Exhaust and decal look good! I wonder what will end up in my garage next? Ross is lucky. Not just to have bought this BNR34 but to have in you a trusting friend. I think the downward pointing needle on the BCNR33 instrument cluster is fantastic. Much like the DC5. Would have been nice in the BNR34. I would love to have the Mines decal that you have on your car. Now I know why it is not readily available. A great read as ever, so thank you for sharing. Great to hear from you, and thanks for the kind words! I really enjoyed this article. 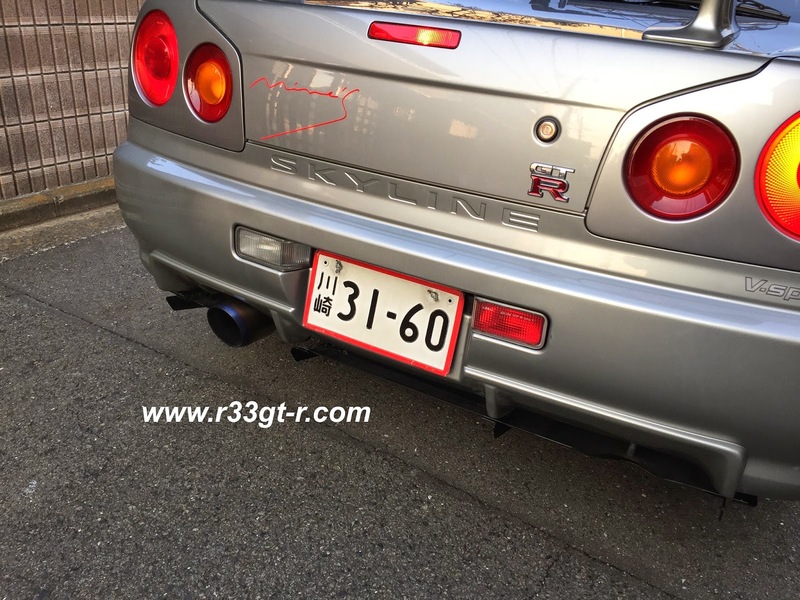 I own an R33 Gts-t and I have always wondered what the difference was between a gtr and gts-t when the modding game begins. Thank you Stefan for your comment! Is your GTS-T tuned as well? I recall driving one once that was not tuned, very very different in feel from the GT-R which of course felt heavier up front!